If you want a family member to leave your home, you must follow an eviction process similar to the one for a formal tenant. In most states, you can evict any family member over the age of 18. Regulations regarding eviction vary, so make sure you follow the specific procedure for your location. As an example, in San Francisco you cannot evict a family member with a child under the age of 18 unless the eviction occurs during the summer, according to attorneys Goldstein, Gellman, et al. Gather documents relating to your home and the person you wish to evict. These may include documentation proving you own the home, copies of any rent checks the family member has paid you, and a blank eviction notice form. Give written notice to the family member, informing him or her that you wish them to leave. Legally, you must give this written notice with sufficient time for a response. According to Sara Gebhardt, writing in the Washington Post on January 22, 2005, a 30-day notice period is common. Regulations vary, though, so follow the requirements for the state and city where you live. Wait out the notice period. 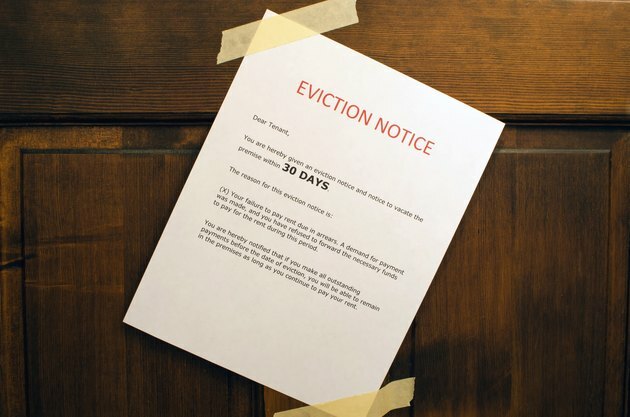 If your family member does not leave the home at the end of the period stipulated in your written notice, you will need to start eviction proceedings. Fill out the eviction notice form. Include all required information, such as the person's name, the address of your home, and a reason for the eviction. The reason can be as simple as failure to pay rent, or a failure to meet expectations of living at the home. Keep any personal attacks out of your eviction documentation, and be clear and concise. Make two copies of the eviction notice you have filled in. Ask the family member you wish to evict to sign and date both copies. Give one copy to the family member and keep the other copy for yourself. File for a court hearing if the family member refuses to leave the home after being served with an eviction notice. Again, there may be a minimum waiting period before you can go to court. At the hearing, the judge can issue an order of eviction. This will enable you to call for assistance from law enforcement if it's necessary to remove your family member from the home.